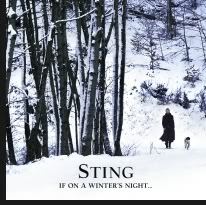 Sting's new, critically-acclaimed album, 'If On A Winter's Night...' debuted at #1 on Billboard's Classical Crossover Chart and #6 on Billboard's Top 200 Chart, following its anticipated October 27 release. To commemorate both the Deustsche Grammophon CD, which continues to dominate the charts, and the newly released companion DVD, Sting will be performing two exclusive concerts at the famed Cathedral Church of St John the Divine in New York City on December 8 and 9. Both shows sold-out in minutes and mark the only planned U.S. dates. On Thursday, December 10, Sting will also be signing his CD/DVD at Best Buy (Broadway & 62nd) in New York City at 5PM. Throughout December, he will also be appearing on high-profile TV programs including CBS Sunday Morning, Larry King Live, Live with Regis & Kelly, ABC News Nightline and World News Tonight with Charlie Gibson as well as MSNBC's Morning Joe. His Great Performances Public Television special, "Sting: A Winter's Night..." will also have repeated airings on PBS stations, nationwide, throughout the month of December, following the commercial DVD release of the concert on November 23. Critical praise continues for 'If On A Winter's Night...' "Evocative mood music perfect for chilling out by the fireplace, especially during the holidays," says People Magazine. CNN states, "the album is a folksy toast to winter, Sting's favorite time of year, and the imagination and reflection the season inspires." The UK's Daily Mail lauds the album as "refreshingly authentic," while The Irish Times celebrates it as "one of the most memorable and adventurous albums you'll hear this year."